The USB-C to HDMI/VGA Travel Dock SE is designed for extra connectivity demands. With the adapter, you can extend the connection of a computer to USB peripherals, Ethernet network, and displays via USB-C interface. Feel free to plug in upside down for USB-C plug is reversible. 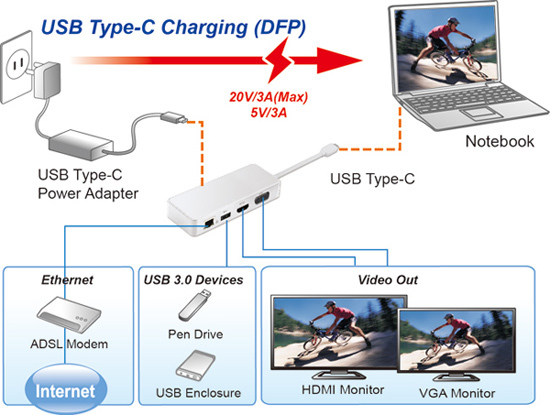 With HDMI or VGA video output, the adapter enriches the user’s experience. The bus-powered design is convenient for travelers, and the self-powered design allows the user to charge via USB-C port. By including an RJ45 Ethernet port, gigabit network can be accessed through the USB port. Overall, the stylish, sleek and compact design makes the adapter your perfect solution for USB port expansion.